Intensely pigmented. Incredibly tenacious. MAKE UP FOR EVER is famous for their eye makeup, inspired by the requirements of the stage. From eyeshadows, to eye liners, to brow perfection, all the way through to finishing touches such as mascara - there's a professional choice for you. All you need for beautiful eyes, and brows on point. MAKE UP FOR EVER specialise in colour innovation. Artist Shadows are smooth eyeshadows that blend effortlessly, in shades that are flattering and on trend. Eyeliners that last the test of time. The popular MAKE UP FOR EVER's Aqua XL range is waterproof, with the kind of next-level resistance preferred by synchronised swimmers. Tired of lashes with no impact? MAKE UP FOR EVER mascara range has what you need. Amp up the drama with Smoky Lash, the mascara that does it all - or Aqua Smoky Lash if you need something waterproof. For definition that lengthens and lasts, Smoky Stretch is the mascara for every day that everyone is talking about. 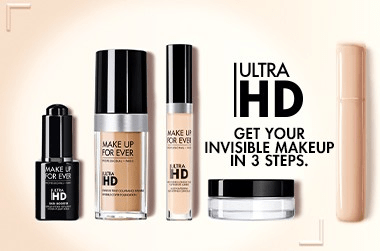 Shop MAKE UP FOR EVER's range of eye makeup products, from an Australian online store. Adore Beauty is an official stockist of MAKE UP FOR EVER, with free standard Australian shipping on all orders. The fact this product primes lips and eyes was a big plus for me. The primer applies nicely to eyes and lips however I do not use it on my eyes daily as it tends to really grab other products. For the price the quality is great, the product applies nicely and looks great. I learnt about this through being backstage at a fashion show, and I noticed that every MUA stocked them in their kit. Upon trying them myself I can definitely see why! I love the colour range, find it super long wearing and if used with an angled liner brush can create hair like strokes so simply! A very effective make up remover for my eyes - it is very gentle yet does a great job of removing the most stubborn make up without it irritating my sensitive eyes. I would highly recommend!